Make this easy, go-to salad that is packed with flavor as well as healthy vegetables, beans, and greens. I’m a salad girl. Ever since I was counting birthday candles in single digits, I’ve been a lover of the greens. My roommate in college always shook her head at my fascination with salads at meal times. My husband has just learned to humor me. Over the years I encountered restaurants that really made great salads: Brigitte’s Caesar, Chichi’s Italian, and Cahoots’ House. After five years living in San Diego I haven’t really found a restaurant salad to really make my heart sing. So, I make them at home. With a prolific produce box and a few great toppings, I can make a homemade entree salad for about two to three bucks which is a far cry from the $8 to $10 that restaurants charge. So, it’s probably a good thing that I can’t find a great restaurant salad. I can make more great homemade salads for the same price. This salad is one of my go-to salads, especially in summertime. One, the weather is warmer, and I don’t feel like eating something heavy. I often go meatless as a way to eat light. Summertime is also the time when I am more cognizant of my eating habits and trying to trim down. I know that with an ounce of cheese, a drizzle of olive oil, some avocado, and all the vegetables I desire, I can stay in a reasonable calorie range as well as eat well and healthy. It’s good cheap eats, all dressed up. Looking for more bright ideas to get dinner on the table? My latest cookbook is here! And it’s designed just for you to make dinner quickly, easily, and affordably. 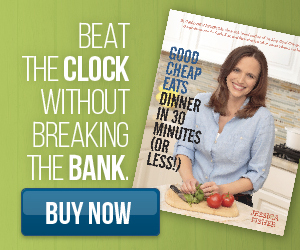 You can beat the clock without breaking the bank. And you’ll eat well too. Click here to see what’s inside and to buy your copy. 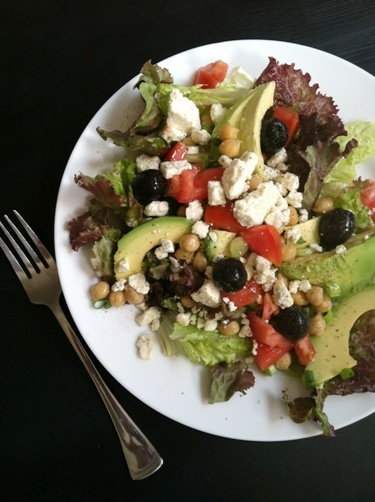 Layer the greens, avocado, beans, tomato, cheese, olives, and scallion in the order listed. Drizzle the vinegar and oil over the top. This salad looks fabulous! And one my husband and I would love! This is almost our exact go to salad as well. We use feta, kalamatas and sometimes balsamic vinegar-other than that all your other ingredients, plus maybe red pepper strips if we have them. I cook dried garbanzos and freeze them so they are always ready. Also, our neighborhood fruit stand has pee wee avocados 4/$1 right now. I love those little guys. Ever tried sherry vinegar? I just got a bottle and it’s fabulous. I’ve never tried just drizzling the oil and vinegar over the salad–I always whisk it up like a vinaigrette, but I should give that a try sometime. Love a good salad! Oh, how yummy this looks. I love how you put avacado on so much. I know just what you mean about restaurants’ inability to serve a “good” salad. My DH is the city’s building inspector. Every time someone wants to come in with a new restaurant, he asks them if they make “good” salads. They all answer with an enthusiastic affirmative, but they never do. Their concept of mixed greens is iceberg with romaine. 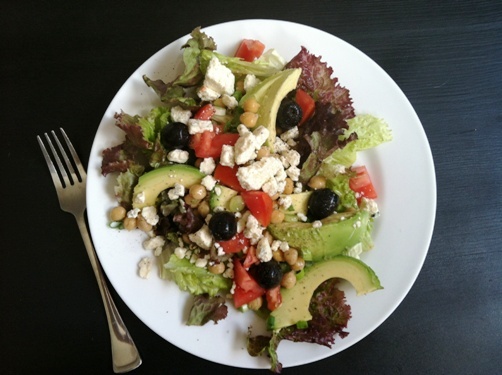 With the hundreds of restaurants, fast foods and mom-and-pop places to eat in this city, only two serve “good” salads that look like yours and that have olive oil instead of canola or vegetable. So we make our own too. Make our own vinegars too. Today was a bit hectic because I was out for most of the morning for an appointment and I had to leave for work at 12:00 and will not be home again until 10:00. I did manage to make a yummy peachy chicken salad. I have been craving it for awhile and was happy to see that I had all the ingredients to make a batch. My husband made some spinach indian concoction last night for dinner that he poured over chicken and topped with laughing cow cheese ( which does not melt) it was not good. My husband would not even let me save the leftovers because his pride was wounded that his meal did not turn out. I caught a glimpse at the flyers for the coming week and was thrilled to see that flour was on sale. I am down to my last cup so I will have to stock up this week because in my neck of the woods it only goes on sale for this price three times a year. I still have plenty of fruit left and some salad fixings. We are out of Kefir ( my husband used it in the spinach concoction) I was not happy because I use it in my smoothies every morning and I was trying to stretch it. Oh well. Only three more days until holidays and then I will plan to use up what I can for the next two weeks and do a freezer cook. We have a half a cow in the freezer and another freezer with a lot of chicken so protein is not an issue at my house. I love reading everyone comments. Been holding onto this ever since I saw it in your facebook feed. Made it tonight and it was fabulous! Instead of layering it, I just doubled everything and tossed it in a bowl. I made pasta for our boys and had the salad to accompany it, but my husband and I had it as our dinner. Tasted like a yummy bowl of vitamins. -Chopped everything really small so it was super easy to eat.